It looks like Frozen 2 may actually be giving Elsa a girlfriend. That is, if a new rumor is to be believed. The Disney sequel is currently in the works and the studio has been taking their time developing the follow-up to make sure that everything is just right. They don't want to rush the next entry in a billion dollar franchise. 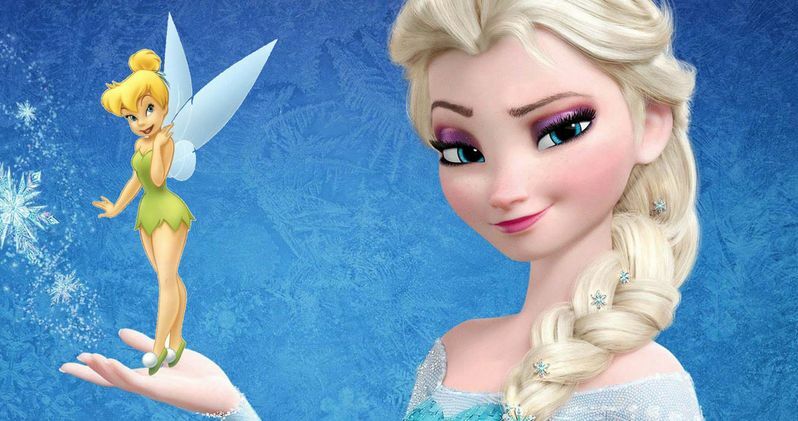 Now, a new unconfirmed report claims that the sequel will indeed establish that Elsa is gay. This is far from the first we've heard of such a thing possibly happening. That said, since this isn't coming directly from Disney or from anyone involved in the production, it should be regarded as a rumor for the time being. This new report claims that Frozen 2, in some way or another, will establish that Elsa is a lesbian. How exactly this will be accomplished, assuming this is true, has yet to be revealed. The report indicates that this could be done by giving Elsa a love interest, which would seem to make the most sense. There was a very strong campaign online to #GiveElsaAGirlfriend in Frozen 2. Many felt it was implied in the first movie that she was a lesbian and they want to see Disney pull the trigger and pay that off in the sequel. While this is far from confirmed, this report also speculates that Westworld star Evan Rachel Wood, who is a member of the LGBTQ community and an avid voice within that community, may be playing Elsa's love interest in the movie. Wood was added to the cast in July, along with Black Panther and This is Us star Sterling K. Brown. Should this actually come to pass, it would be a big deal for Disney. They've flirted with bringing LGBTQ characters to the big screen in their movies recently, but they haven't really committed. Josh Gad's La Fou had a scene in last year's Beauty in the Beast where it was implied that he had a thing for Gaston. It was extremely subverted. There was also Tessa Thompson's Valkyrie in Thor: Ragnarok who was supposed to be bisexual. There was a scene that hinted at this in the movie, but it wasn't at all explicit. Black Panther also removed LGBTQ characters prior to making its way to theaters. That begs the question, to what degree will Frozen 2 portray Elsa's sexual orientation? Co-director Jennifer Lee, who was recently promoted to Chief Content Officer of Walt Disney Animation, left the door open while discussing the topic earlier this year. Given her new position, she'll have a little more power in pushing this through, assuming she and co-director Chris Buck decided it's the right thing to do. It's also worth mentioning that Allison Schroeder was recently brought in to do some additional work on the script. Maybe that has something to do with this rumor? Frozen 2 is currently set for release on November 27, 2019. This news originated with Revenge of the Fans.